All connector products are capable of being mated or unmated underwater with electrical power de-energised. A precision interference fit between contacts and neoprene-neoprene interface ensures waterproof integrity when correctly installed and maintained. All UNF threaded fittings are nickel aluminium bronze and are designed for ‘O’ ring sealing. All are supplied with an ‘O’ ring. All right angle bulkhead connectors are supplied with a nut and washer. Bulkhead connectors are moulded directly to the face of all threaded fittings to provide maximum strength. The male pin is flared at the tip and oversize to the inside diameter of the female socket. This ensures a wiping action and positive seal by forcing water through the length of the female socket and out of the vent. 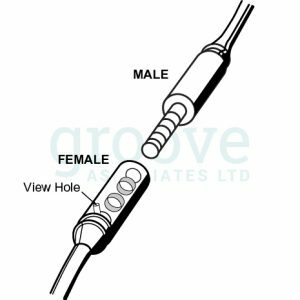 Female connectors (having recessed contacts) are recommended for use on the “live” side. When using bulkhead connectors, care should be taken that the surface on which they are mounted is flat and smooth. Bulkhead connectors should be mounted in such a manner that no positive pressure is on the threaded (low pressure) side. Electrical power must be off prior to and during installation and maintenance. Electrical power must be off prior to and during maintenance. As with any equipment, inspection should be performed regularly. 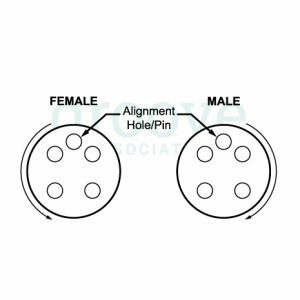 Oxidation may be removed from male contacts by using no less than P800 wet/dry emery paper cut in strips equal to or less than the width of the contact and rubbing lightly. Female sockets may be cleaned using a cotton swab and isopropyl alcohol. A 0.22” calibre bore brush with nylon bristles only may be used to remove light contact oxidation. 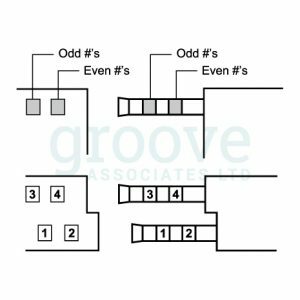 * Contact No 3 is Green on all 315 FC and MC cable connectors. To extend the life and increase the reliability of the connectors, apply silicone compound to the entire surface of each male pin. Silicone should also be applied at the entrance of each socket. Relubrication is recommended every three to five mating cycles. The use of Dow Corning DC4 silicone compound is recommended for lubrication.